SURREY, BRITISH COLUMBIA, August 1, 2018 – 4 Pillars Consulting Group and Legal Line announce partnership to increase support to more Canadians facing crushing debt. 4 Pillars and Legal Line are pleased to announce they have established a formal partnership in order to increase support for Canadians confronting financial crisis. Currently, under Canada’s Bankruptcy and Insolvency Act, debtors do not have an exclusive advocate and are at risk of lawsuits and other legal actions. Licensed Insolvency Trustees (LIT’s) who hold legal responsibility for administering under the Bankruptcy and Insolvency Act are limited to two options (consumer proposals and bankruptcy) and must exercise caution in the advice they can provide to debtors during their initial discovery into the debt options. • Increased awareness in how to rebuild a strong credit rating. This partnership acknowledges that for many, a financial crisis can be resolved long before legal action begins, and creditors file a lawsuit. In addition, Legal Line will be offered as a valuable resource for legal advice and support as part of the 4 Pillars service offering. Those who still need to speak with a professional will be referred to a specific lawyer, government office, or other professional who is trained on that specific issue. Through this partnership, the debtor will receive much needed information about their rights and options, protecting their ability to make fully informed decisions in their best interests, at one of the most stressful times in their life. 4 Pillars Consulting Group is a dynamic Canadian-owned company. As debt and credit specialists with expertise in providing support and guidance in the restructuring of our client’s personal debt, we provide our clients with a roadmap to build a debt free financial future. 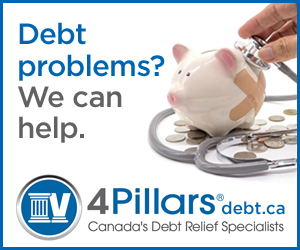 With over 60 locations across Canada, 4 Pillars is the exclusive advocate of the debtor and our clients have a near perfect track record of successfully completing their restructuring plans and starting the journey to financial stability. Legal Line is a federal not-for-profit organization providing access to Canadian laws since 1993. Educating the public about the law is a necessary step in advancing access to justice. Legal Line provides easy-to-understand legal answers, written in plain language. Its 24-hour telephone on online information portal helps hundreds of thousands of Canadians every year. The Legal Line database covers 42 major areas of law and it is able to provide support in 107 languages. I learned about Legal Line thru 4 Pillars Head Office. The fliers and guides will be given out to clients that come to our office. Quiet often we get clients in our office that have legal issues in their situation that we aren’t qualified to answer and they can’t afford to go talk to a lawyer so this will help them tremendously. It will also be a help to us as we come across different situations regularly that we need advice on ourselves. Our head office has developed a referral relationship with LegalLine. The brochures will be given to each new client. Some clients have legal issues that require expert input and LegalLine will satisfy that need. I will put the flyers on my desk. We are here to help those who have overextended themselves with credit. We find a comprehensive solution to set up individuals and families to get a fresh start. Very often out clients need legal help. I would like to display your brochures in my office. Quite often we have people looking for legal advice. Since they are typically in financial difficulty the cost of meeting with a lawyer is prohibitive and your site provides an excellent resource for them. We are in partnership with Legal Line referring business to each other. Will hand out flyers to clients new and existing. Our clients often face legal issues, being sued, divorce etc. 4 Pillars owners introduced me to Legal Line. Flyers will be on front desk for my clients. Many of my client will benefit from your services. Great partnership with 4 Pillars and Legal Line, clients are always looking for legal information. I will distribute the flyers from my office to clients who have legal questions or issues. LegalLine gives me a great referral partner to offer to my clients needing legal information. It adds credibility to my business by having a quality referral partner. We have a partnership with Legalline. I will display these in my office and my staff offices. Often times clients come in and have options that require a legal opinion.